The farther a man follows the rainbow, the harder it is for him to get back to the life which he left starving like an old dog. Sometimes when a man gets older he has a revelation and wants awfully bad to get back to the place where he left his life, but he can't get back to that place-- not often. It's always better to stay alongside of your life. Jane Auer was born in New York City on February 22, 1917 and raised mostly on Long Island. At twenty-one, she married Manhattanite Paul Bowles. After the civil ceremony, they took off for Panama. 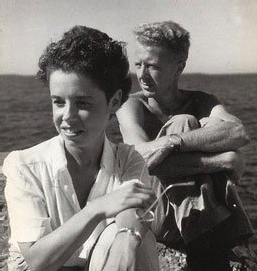 According to Paul Bowles' autobiography Without Stopping, Jane Bowles saw enough in Panama in ten days to enable her to use it as a locale for her first novel, 'Two Serious Ladies', which was published in 1943. From 1947, she lived abroad, mostly in Tangier, with her husband. In 1954, Jane's play 'In the Summer House' was produced. It was met with acclaim from the less conventional (including Tennessee Williams). She wrote short stories, a novella, and in 1966, her final novel, 'Plain Pleasures'. Her work was subjected to much criticism, possibly because of its subtle nature. She took the criticism good-naturedly, although she drank heavily. Her life was like Virginia Woolf's in ways-- an unconventional marriage, battles with moods and self-image, and the lesbian attractions. Jane's health deteriorated until it became necessary for her husband to institutionalize her in nearby Spain. She died on May 4, 1973, and when she did, her husband said he lost his interest in writing fiction. Who now did he have to read it to and share ideas? Her works, all marked with a dry wit and a quirky intelligence, have yet to earn the respect they deserve. No Responses to "Jane Bowles"
"A small crowd gathered around the dumpster in the rain. Word filtered back that the girl was a teenage hitchhiker. I remember thinking that it could be me, because I was also a teenage hitchhiker."